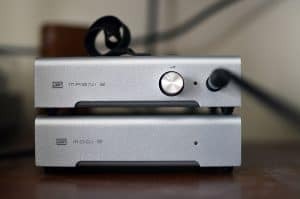 HomeHeadphone ComparisonsSennheiser HD 650 vs. HD 700 | BIG DIFFERENCE! Before we dive right into the Sennheiser HD 650 vs. HD 700, grab a snack, sit back and relax because.. Frequency response: 10 – 39.5 kHz. Sensitivity: 103 dB/mW. What is Sensitivity in Headphones? Plug size: 1/4″ (1/8″ Adapter Included). Material: OFC copper (kevlar reinforced), velour ear pads. Another thing to note is the impedance level. At 300 Ohms, these will need an adequate amplifier to reach their full potential. What is Headphone Impedance? Since 2003, It’s been one of the most beautiful sounding headphones around. It’s extremely accurate, has a really great mid-range, accurate bass, and is very comfortable over a long period of time. It’s treble is lacking a bit in the upper registers, and it has been criticized for being a bit too smooth, almost lulling you to sleep. Regardless, what you are getting with these is a brand new music collection. Why? Because they revolutionize everything you own, plus the music you haven’t heard. It’s like hearing all of your old favorites for the first time again. You will start to notice things in music that you never knew were there. This is one of the best things about higher end headphones. They make you realize what you were missing! Ah, the HD 700’s. Many people refer to these so lovingly as the HD 800’s evil twin brother. Or sister. Lol. They are an exceptionally warm set of cans, but at the same time neutral and honest. They have a really good sound-stage as well, with a more relaxed treble reproduction. Where as the 800’s have been accused of an overly bright representation in the high end, the 700’s are much darker. Warm character. These are very transparent, and elegant, with a musical warmth. True to life acoustic presence. Treble is crystalline and sharp without fatigue. Angled transducers, good Soundstage. What is Soundstage? Not amp picky like the HD 800. They don’t over emphasize any particular frequency range. Neutral but warm. They allow for nuances in sound to be heard in each instrument and voice. Headband cushioning could have been better. Metallica, Genesis, Tears for Fears, Metallica, NWA, Sting, The Scorpions, Post Malone. There are really no glaring similarities to speak of here. In actuality, these are vastly different headphones. Generally speaking, both have good sound-stage, comfort, and do well with classical and jazz. The HD 650’s cable terminates in 3.5mm jack, and comes with a 1/4″ adapter. The HD 700 terminates in a 1/4″ jack and does not come with a 3.5mm adapter. You would have to purchase that separately. The HD 700’s are easier to drive than the 650’s. The cups are a bit roomier than the 650’s. They are more comfortable than the 650’s. The HD 700’s have better all around technical prowess. They are clearer, cleaner, more articulate, and crisper. They have better transients, and better speed. They overall sound is tighter and more coherent. They have better resolution and are more detailed. They have a reasonably improved sound stage and imaging. They are more open and speaker like. They have more detailed and believable vocals. The 700’s however are more fatiguing over long listening sessions. The additional treble makes the 700 brighter than the 650. The 700’s sound less natural and musical. Their tonality isn’t as neutral; vocals a bit upfront. The 650 is more musical, lush, smoother, and sweet. The bass isn’t as tight but it’s more natural and with greater punch. The treble isn’t as sharp; it is smoother. The 650 is more suitable for extended listening. The 650 does better with rock music. The HD 700’s bass is super tight, with up front vocals, and a tighter sound overall. The 650 is more neutral and balanced. It sounds smoother and sweeter, and more musical. The HD 700’s sound-stage is a bit better overall. The HD 700’s vocals are more articulate and realistic. They have better resolution and are more detailed, upfront, and crisp. The HD 650 is more musical, rounded and smoother. The HD 700’s bass is a lot tighter. The HD 650 is far more hollow and rounded, more natural. It’s smoother, with more punch (like Hi-C :P). The HD 650’s treble is better, while the HD 700’s is a bit peaky and takes time to adjust to. HD 650’s is more natural and balanced. HD 650 is better. What is Timbre? HD 650 good, but not exemplary. HD 700 is more comfortable. to the 700. That’s not to say the 650 is a messy headphone. It’s just a bit outclassed here. It’s hard not to recommend the HD 700’s. They outshine the 650’s by a considerable amount. OFFICIAL SENNHEISER HD 600 REVIEW!! Well that’s about it for today my friend! I hope you’ve enjoyed this article on the Sennheiser HD 650 vs. HD 700. Which of these tickles your pickle? What do you think about the HD 600 for mixing? I would love to hear from you. Until next time..